This complete beginners guide to painting flowers in watercolour is ideal if you want to learn to paint but are short on time. 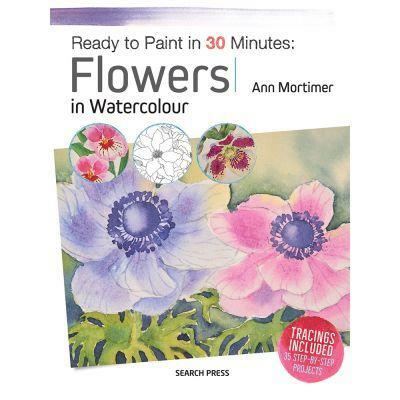 Each of the 35 quick and easy exercises takes no more than 30 minutes to complete, and will teach you how to paint flowers of different shapes, colours and families lilies, orchids and hellebores amongst others or learn a key technique such as masking out, working wet in wet and colour-mixing. The exercises are all worked at postcard size ideal for a 6 x 4in (A6) watercolour pad, and tracings are included for each study. The book is broken down into five chapters that focus, respectively, on working with watercolour, watercolour techniques, colour and tone, form and detail, and finally flowers in context. The final section of the book contains three complete paintings that demonstrate how to combine all the techniques and elements of painting flowers, as learned from the preceding chapters. These paintings, too, are accompanied by actual-size tracings. Ann Mortimer is a professional artist and watercolour tutor. She received no formal art training after A level Art at school, and instead studied for a degree in European Studies at UEA. After completing a PGCE at Southampton university, she became a French teacher. Later, she retrained to do infant teaching and so her students have ranged from age 5 to 85. In 1990 she was able to rekindle a lifelong love of painting and drawing. She became fascinated by the medium of watercolour and was soon exhibiting and selling her work. She has had work commissioned for greetings cards and mug wraps. Ann is a member of the Society of Floral Painters with whom she exhibits regularly. In 2008 she was awarded the Popular Choice Salver at the SFP annual exhibition at Mottisfont Abbey in Hampshire. Ann now runs watercolour workshops in her Garden Studio at home and is a popular teacher for art societies around the country. She has written several articles for Leisure Painter magazine. Ann lives in Nottinghamshire with her husband. She has three grown up children and loves gardening and all things French.